FILE - People walk past a propaganda billboard showing Chinese President Xi Jinping on a street in Beijing, China, March 2, 2018. An academic who has been exposing the back-door methods of the Chinese seeking to influence New Zealand politics as well as the country's media and universities says she is being targeted and harassed by Beijing. "Brady has become the target of a series of incidents which, taken together with attacks from party-directed media, are consistent with an intimidation campaign," the experts say. 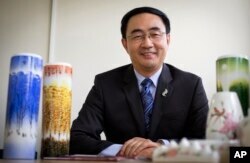 "New Zealand authorities have been less than forthcoming in their support for a prominent scholar targeted by a foreign power, at times even adopting a dismissive posture — an attitude appreciated by PRC [China's] state media." Brady says she was targeted after the publication of her "Magic Weapons" study detailing Beijing's influence on public life in New Zealand. She told an Australian parliamentary committee earlier this year that China was seeking to infiltrate New Zealand party politics, media and education in a bid to shape public opinion, warning both Australia and New Zealand appear to have been singled out as "test zones" for China's "covert, corrupting and coercive activities." New Zealand's police and intelligence service are investigating the break-ins and car tampering. Brady says she has made multiple requests for protection. Police officials say they have some "positive lines of inquiry," and Interpol is now involved but declined to comment further. In her study, Brady says China has an integrated global strategy "to guide, buy or coerce political influence abroad ... on a larger scale than that being carried out by any other nation" with efforts underway to infiltrate political and foreign affairs circles as well to utilize the Chinese diaspora in order to "turn them into propaganda bases for Beijing." Chinese populations can sometimes be used as a cover for intelligence activities, she warned. "China's foreign influence activities have the potential to undermine the sovereignty and integrity of the political system of targeted states," she wrote. She says Chinese President Xi Jinping "has led a massive expansion of efforts to shape foreign public opinion in order to influence the decision-making of foreign governments and societies." The title of her study, "Magic Weapons," is a reference to the description Xi Jinping gave for using individuals and organizations outside China to promote the interests of the Communist Party. FILE - Jian Yang, a New Zealand lawmaker who was born in China, speaks Jan. 26, 2016, in Auckland, New Zealand. Yang said in a statement Sept. 13, 2017, that he's loyal to his new home after media reported he'd spent a decade at top Chinese military colleges and was investigated by New Zealand's intelligence agency. New Zealand Prime Minister Jacinda Ardern has said she "supports and defends the legal right to academic freedom," but has declined to comment further on Brady's claims of a harassment campaign before police have concluded their investigation. "Speculations on China's role in New Zealand politics are totally groundless," it said in a statement. But academics, rights activists and journalists have maintained a drumbeat of support for Brady. In their open letter, the China experts from around the world say under Xi Jinping's rule domestic repression has increased, "as illustrated by the fate of hundreds of human rights lawyers and activists rounded up." They say China scholars overseas are also being targeted. "Another form of this escalation are the unprecedented attacks on foreign scholars and researchers of contemporary China, be it in the form of Cultural Revolution-style in-class harassment for their views and opinions, denial of visas, threatened or actual libel suits or, in some cases, detentions during research visits in mainland China," it says. Vice President Mike Pence speaks, Oct. 4, 2018, at the Hudson Institute in Washington. Pence said China was using its power in "more proactive and coercive ways to interfere in the domestic policies and politics of the United States." 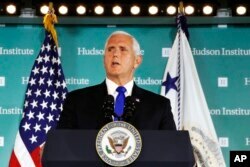 "Beijing provides generous funding to universities, think tanks and scholars, with the understanding that they will avoid ideas that the Communist Party finds dangerous or offensive," U.S. Vice President Mike Pence said in a speech at the Hudson Institute in Washington. "China experts in particular know that their visas will be delayed or denied if their research contradicts Beijing's talking points," he said. The Chinese government has denied the accusations.